I was thinking about using winter for this assignment and then it occurred to me that might be limiting to some. White being the predominate color in winter does make for a suitable topic for all. What will you do with “white”? Indoors, outdoors, studio locations? Contrast it? Highlight it? Subtle or bold? Color or B&W treatment? Since I am doing these assignments every other month, I am giving you more time to post your photos which I would like you to go out and photograph this time. Be creative and have fun! 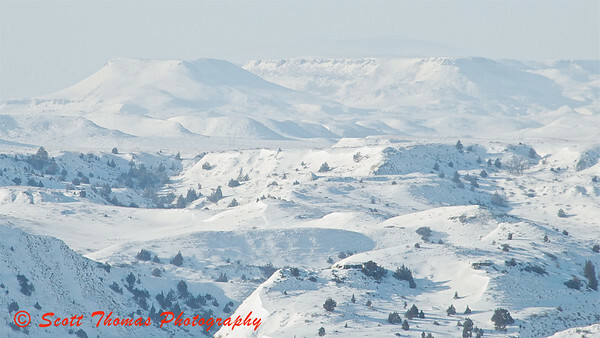 A white landscape in the Theodore Roosevelt National Park near Medora, North Dakota. By shooting at an angle away from the sun, the sky washed out and blended into the Badlands. As in the other assignments, do not send me your photos. What I would like you to do is post them on your blog, flickr or other photo sharing site, personal website or any other place on the Internet where you can place a link to it here by making a comment to this blog entry. Then we can visit those sites and learn what we did with the color, White. Please, have your photos posted by Wednesday, February 3, 2010. Don’t have a place to post? Might be a good time to start up a blog or join a photo community like flickr or Exposure. As I do for all Assignments, I’ll put together a recap with my comments. If you have any questions, leave me a comment and I will be happy to answer them. By the way, I would really appreciate it if you would help spread the word about this so we can get lots of people to participate. Thanks! This entry was posted in Assignments and tagged assignment, challenge, landscape, national park, north dakota, Photography, theodore roosevelt, white. Bookmark the permalink. Great new assignment! Already spent time, taking pictures for this today. Enjoyed looking at this photo, certainly has the White Capture. What great timing. I just did a blog post on my difficulties with HDR and snow. That is an absolutely gorgeous ‘white’ landscape photo. Great assignment. I’ll see what white I can come up with. Hmm…. Oh, I am sure you will find something to share with us, Anna. Yikes…gonna have to pull out some old Workshop notes for this one. Thanks, KD. Always helps to review those notes. Jennifer, maybe you can take a better one for this assignment? Great with a new assignment, Scott. What a fantastic landscape, I wonder if it ever become all green? Was it as cold as it looks? Birgitte, you need to read about my trip to North Dakota just a few posts back. Oh, yeah, it was cold as in -25 degrees F cold. The rock bluffs have a lot red coloring in the summer. I will be going back sometime to see that. Neat assignment Scott! Looks like I am the first to put forth a submission. Anna beat you to it, Tracy. 🙂 Very nice high key photo which definitely says “white” with attitude. See, you don’t need snow to find a white subject. Nice one, Nye! Well, I can’t come up with snow so Plan B will have to do. Plan B turned out to be amazing, MJ! Thanks for the new assignment Scott. Lets see if something that can be classified under ‘White’ pops up. Yes, the rocks which are snow covered in the photo usually are bare and very red. I caught a glimpse of that red later in the day (and a couple of posts back). Who would have thought a washed-out sky could look so lovely? It must have been quite spectacular to see all that white in the landscape in person. It was quite the sight, Amy. Your post on animal tracks in white snow was well done. Oh, well done, Michaela. White is often associated with softness as your post shows us. Now, now, I know you can find us some white in the streets of London, YB. I’m new to this world so all I’ve got is a camera phone but I love winter so I thought I’d give this a shot. The BEST camera is the one you have, Chris. Looking forward to your posting! Hi, Just found your site today and have been enjoying a bit of back reading. I didn’t take these for the assignment, but they were taken after the assignment was posted! Admittedly some were a bit washed, but there is always next time. Hope my shots of something Snowy in owl form work. I’ll give you a Mulligan this time, Dave! 🙂 Great shots and you nailed the exposure. I got white!! LOL It snowed this morning. Like I said..WOW! Snow right down to its white crystal lattice. thanks! your comments really made me happy. I got white too. And a little joke yolk. Good one, Sir! Now I’m hungry! I’m slipping one in quick before I go on vacation featuring crappy but cute cell phone pictures. I’ll be sure to come back and check out everyone’s entries when I get back. Jennifer shows us it’s not the camera but the person behind it. Her subject has a splash of color and a not so happy pooch. I hope she is enjoying her tropical cruise, too. White is simple. Isa tells and shows us how she is looking at simplifying her life with color and white. Your something is excellent, KD. Something white is going on in Denmark;- snow, snow, and more snow…. Birgitte has captured the essence of snow by focusing on it’s color, texture and form. Nice work! Karma used an illuminated snowman, a gorillapod and learned a few things about exposing a bright white object along the way. better late than never, I hope? You’ve heard of the moody blues? Miekmiek has blended winter white in the north of Holland with the blues and grays which accompany it. Alright, here are the three I’m submitting. I neglected to put them into a single post. Chris, who blog about the fun of getting out in the snow, provides some beautiful landscapes around Jackson Hole. Click on his name to see his blog where the photo links are now posted. Looks like a great place to enjoy the winter. Babs Young says that yes, http://torchlakeviews.wordpress.com/2010/01/24/purple-and-turquoise-and-gold-and-white/ was, in fact, her challenge submission and would I go ahead and link it awready?!? Done. Now, I still have two hours to finish my own homework. Babs uses white for the base of a colorful composition. Excellent work! That was less than two hours, Gerry. 🙂 Nice, ah…take on the assignment. What a beautiful snowy landscape! No snow in the Willamette Valley so I had to do a little searching. Never let it be said that the Torch Lake Irregulars are ever, um, regular. White alligator spotted at Torch Lake, story at 11! Okay, hope this isn’t too late. Here is my White assignment. Did I make it on time? Did I? Hey, you made it!!! IvoryHut puts her culinary talents to work to show us white is good for eating, too. Thank you for participating, IH! Now I was some garlic pizza. Very good exposure on a tough shot. What a great turnout!!!! Thank you one and all for your time and talents. I’ll post the recap next week. I am so glad I gave more time to do these. You all deserve it and a great big hand!